With the fierce, powerful T-Rex dinosaur not all is good all the time, there are many things that this magnificent short armed beast just cannot do. 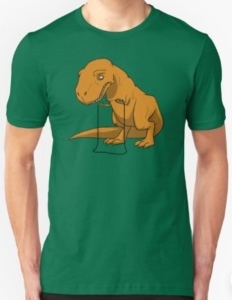 On the front of this t-shirt you will find an image of a T-Rex holding a skipping rope looking very sad, of course the T-Rex is sad with such short arms how are you supposed to skip. All t-shirts are made to be very durable to last you a long time while also super comfortable. Available in a huge range of slim fitted sizes that will range from Small to 3XL and choose from 17 different fun and unique colors to get this T-Rex t-shirt in.